Tom Petty and the Heartbreakers, one of the nation's most-discussed new rock bands, will perform a concert at 8:30 p.m. Monday at the Lane County Fairgrounds. Tickets are available at the Sun Shop, Everybody's Record and Odyssey Records for $6.50 each. They will also be sold at the door for $7.50 each. 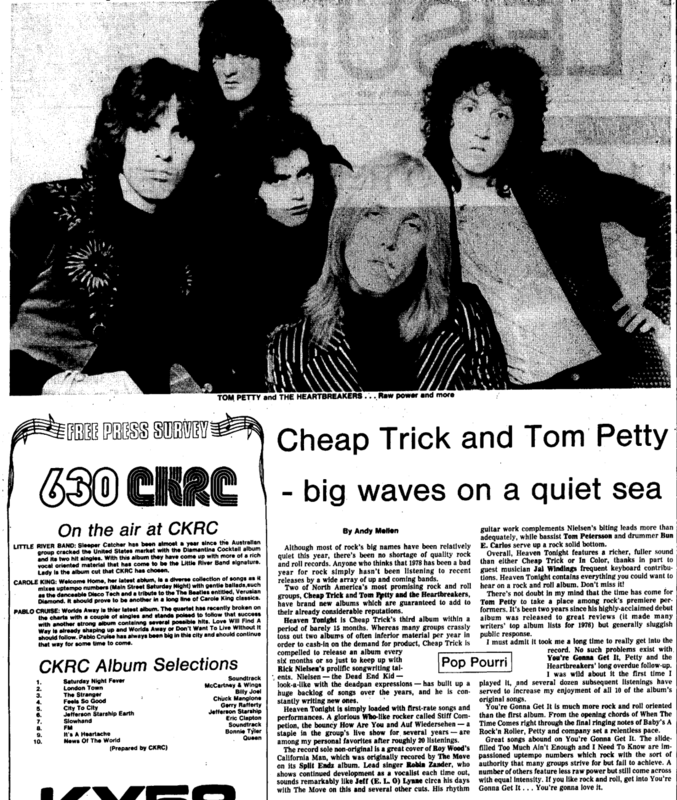 Petty is considered an overnight success in the rock music industry, yet he has been performing for 10 years. He grew up in Ft. Lauderdale, Fla., then moved to Los Angeles as a teen-ager, where he has played in a number of rock bands. Petty put together the Heartbreakers two years ago then snagged a record contract last year that resulted in the release of an album many critics glowingly praised. 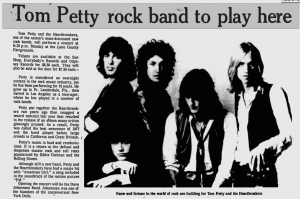 As a result, Petty was called the best newcomer of 1977 and the band played before large crowds in California and Great Britain. Note: I cut out most of the stuff about the other band, but the full article is in the PDF. Although most of rock's big names have been relatively quiet this year, there's been no shortage of quality rock and roll records. Anyone who thinks that 1978 has been a bad year for rock simply hasn't been listening to recent releases by a wide array of up and coming bands. Two of North America's most promising rock and roll groups, Cheap Trick and Tom Petty and the Heartbreakers, have brand new albums which are guaranteed to add to their already considerable reputations. There's not much doubt in my mind that the time has come for Tom Petty to take a place among rock's premiere performers. It's been two years since his highly-acclaimed debut album was released to great reviews (it made many writers' top album lists for 1976) but generally sluggish public response. TAMPA -- Pop-rock punk-poet Patti Smith proclaimed her intentions quickly. Her powerful but ponderous show Friday night in Curtis Hixon Hall had just begun when the lyrical dervish-queen of New York new wave shouted to some 5,500 fans: "Tampa, tonight we're going to settle some scores!" Miss Smith's fans still shudder at the memory of her last Suncoast concert. On Jan. 23, 1977, opening for Bob Seger in the same hall, Miss Smith tripped on equipment and tumbled seven feet from the stage to the concrete floor. The resulting injuries kept her in a neck brace and off stage for months. As if an energetic show could erase the memory of a broken neck, Miss Smith led her four sidemen through a set that made up in intensity what it lacked in prettiness. Two years ago, Tom Petty and the Heartbreakers were the opening act at the Jazz Workshop, of all places. Al Kooper was the headliner, and that was when he had a slick 10-piece group that was supposed to help him along to his umpteenth comeback. The audience had come to see Kooper, but there was a pocketful of young rowdies who wouldn't let Petty and the Heartbreakers leave the stage. If truth be told, Petty did blow Kooper away during that engagement. Since then, Petty et al have continued to improve their concise, joyously unrestrained brand of rock & roll, only this time a sizable audience has begun to catch on. Petty almost vanished from sight last year until his record company, ABC/Shelter, re-released his debut album and the single, "Breakdown," began ascending the charts. Petty would seem to be unstoppable now. The band's second album, "You're Gonna Get It," has just been certified gold (500,000 units), and their Paradie appearance here was a cataclysmic success. "This is the only club we're playing on this tour, so we're making the most of it," Petty said between sets. TOM PETTY AND THE HEARTBREAKERS -- You're Gonna Get It (Shelter) -- Petty is awash in melancholy as he picks through the litter of his life and emerges with some sordid, seamy statements about love and romance. If you've had too much of John Denver's pure air and mountain streams, Petty and crew will fill your lungs with invigorating smog. Electricity was in the air for a recent Miami concert featuring Tom Petty and headliner Patti Smith, but it wasn't the kind that blurbwriters are always looking for. The skies were full of flickering heat lightning when Petty took the stage at the Miami Jai Alai Fronton, but no one's sure just what caused the electrical connection that sent Petty staggering away from the microphone, badly shocked. 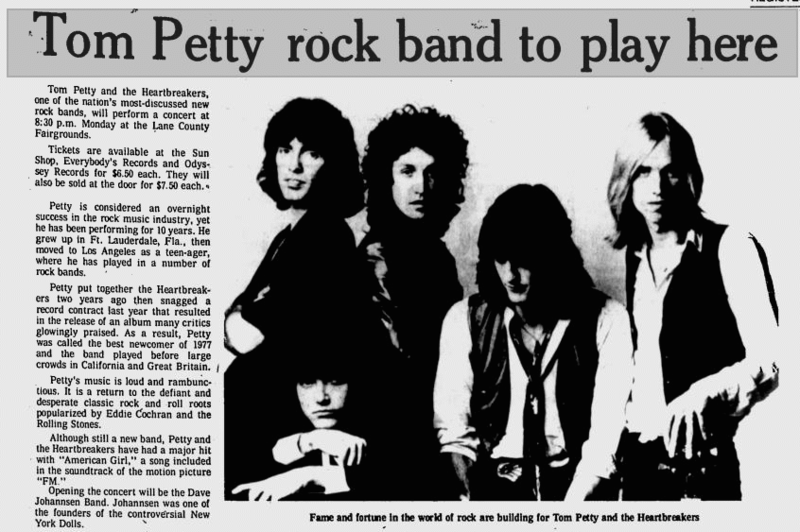 Petty proved himself a trouper by coming back on a few minutes later to finish his set, but they postponed the next night's Dayton, Ohio, gig to recuperate. And Ms. Smith, who went past the hall's midnight deadline, had the power plug pulled on her but stayed onstage exhorting a far-from-capacity crowd (about a third of the 6,000 available seats were filled) by yelling out the words to The Who's "My Generation." Tom Petty and the Heartbreakers. “You’re Gonna Get It!” Shelter – ABC Records. DA-52029. Each song on Tom Petty and the Heartbreakers’ first album has its own distinct magical quality, but on “You’re Gonna Get It!”, their new LP, all the songs fit a little too tightly into the same mold. The problem (if it is a problem) is largely due to a production technique that gives every song the same kind of drunken glow. Look out! Hide your children! It’s the Tom Petty wall…er…ah…puddle of sound! Petty’s got a distinctive sound he can call his own, but poor Petty overindulges. Sounds like he sacrificed some versatility in the production and rushed it a bit on the mixing board to product an economically compact sound. Looking for a romantic rock album? Try "You're Gonna Get It," Tom Petty and the Heartbreakers' latest.